I’m not a huge red meat person, but sometimes a girl has just got to have a steak. This sandwich is one of my favorite ways to enjoy it! A good steak sandwich is a wonderful thing, indeed. 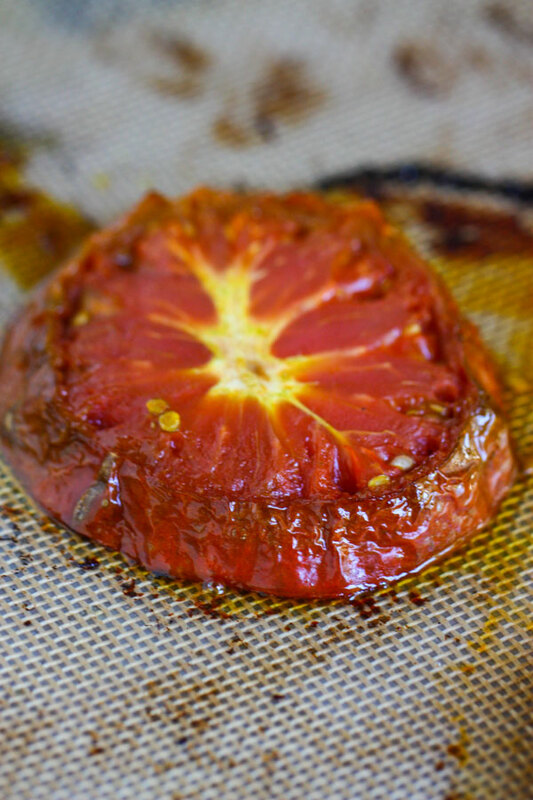 I love roasting tomatoes in the oven because they get a nice, rich caramelized flavor, which is perfect right now as we are at the tail-end of tomato season. I love the big, juicy heirlooms in particular, which are available at many farmers’ markets and come in a variety of sunny colors. 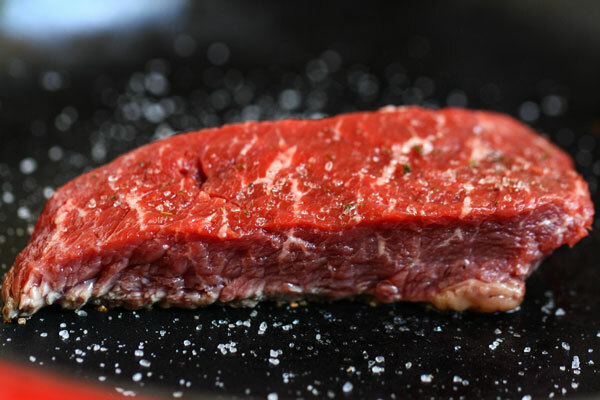 For the steak, I love to sear it in a smoking hot skillet with just a sprinkle of salt. If you’ve never tried this preparation method, you are missing out! It’s quick and most importantly, incredibly easy to do. The key here is to buy a very tender cut of meat, since you are using it for a sandwich. I really like tenderloin for this purpose—definitely not a tougher cut like skirt or flank. Save those for tacos! Enjoy these sandwiches as a Fall or Winter lunch or dinner! I know they will soon become a favorite in your house, too. 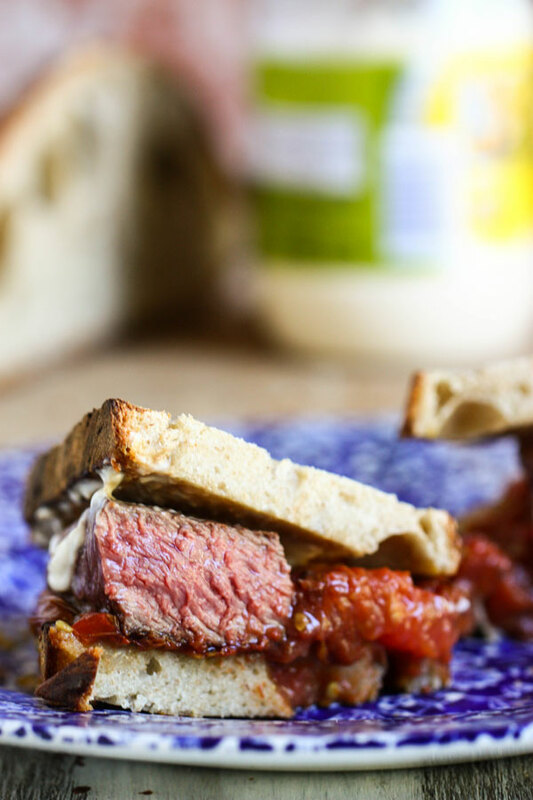 For this delicious steak sandwich recipe - add roasted tomatoes and some rustic, country bread for an easy lunch to fill you up from the Fresh Tastes blog. Slice tomatoes into thick slices and place on a lined sheet tray. Drizzle tomato slices with olive oil and sprinkle with sea salt. Roast tomato slices for about 25 minutes, flipping carefully halfway through. You want the tomatoes to break down and get almost caramelized in the oven. When tomatoes are finished roasting, remove from the oven and let cool while you cook the steak. Heat up a cast iron skillet over high heat. 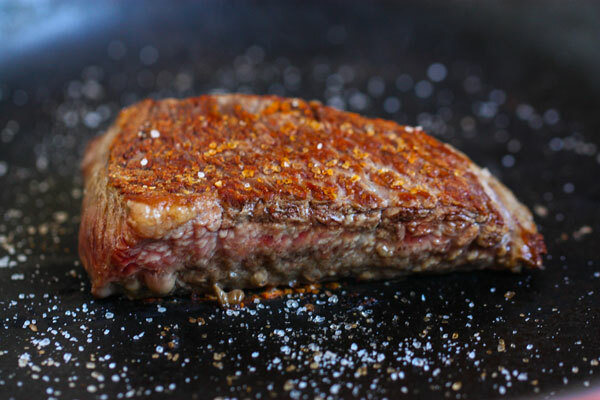 You want the skillet to be really, really hot (practically smoking) before cooking the steak. When the skillet is really hot, sprinkle a generous pinch of salt on the bottom of the skillet. Add the steak and sear for about five minutes before flipping and searing the other side. Cook steak on the stove to whatever doneness you prefer --- about ten minutes seems to do it for me. When done, remove steak carefully from the hot pan and let rest on a cutting board for ten minutes. Slice steak into thick pieces and get ready to assemble the sandwiches. Spread mayonnaise onto half of the bread slices, then carefully place a roasted tomato slice on top. Top with steak, lettuce and another slice of bread. Repeat with remaining slices of bread and enjoy!